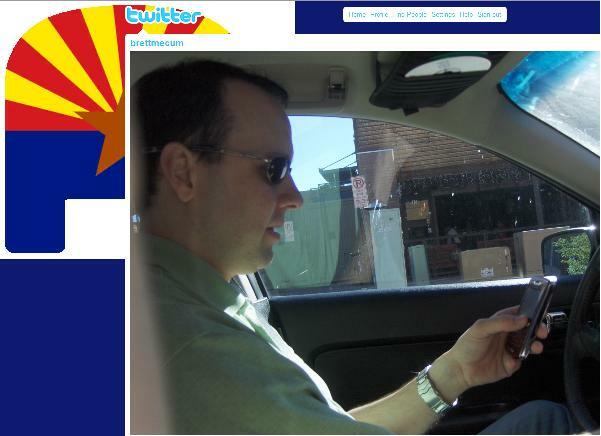 PHOENIX, AZ -- More misconduct has been alleged against Arizona Republican Party executive director Brett Mecum, who is now the subject of a criminal complaint alleging he used the Republican's voter database to stalk a young female graduate student. I did not invite Brett Mecum. He is rather creepy and intimidating around women. I did not want to expose my guests to that kind of individual. I was shocked to see him show up at my party. He had never been to my house, and I had never told him where I lived. I asked him how he found my address, and he responded "I looked it up on Voter Vault, I called a staffer to look it up for me there." [Mecum] alluded to power, connections, and authority as a result of his position as Executive Director of the Arizona Republican Party. I have also seen what malicious things he has done to others and do not want to be subjected to similar retaliatory actions. According to the affidavit, the complainant only came forward because she "would be helping other women by stopping this behavior." She went on to say, "I am concerned for my safety and the safety of other women who have either been or might be stalked by him using Voter Vault. Like me, they were likely threatened by him if they report his harassment and are afraid to come forward"
For months, I have been speaking with local Republican women who approached me with disturbing stories of unwanted sexual advances, persistent harassment, and intimidation by Mecum and some of Mecum's friends. Each complaint was eerily similar; the most common complaint alleged that Mecum "doesn't know how to take no for an answer." None of the women were willing to speak on the record. Some were afraid of Mecum. Others were afraid of hurting the party. Each, for her own reasons, was afraid to speak out. In fact, the only woman who feels safe enough to file a formal complaint against Mecum did so as she was moving out of state. Republican National Committee Treasurer Randy Pullen has also been called out for his inaction. A number of women in the Republican Party say that Pullen refused to even meet with them to discuss allegations of sexual harassment. When asked about the allegation that Pullen has refused to hear complaints from local Republican women in regards to Mecum, Arizona Republican Party spokesperson Matt Roberts did not deny the allegations but said, "If these allegations are out there, I would encourage these women to come in and make their allegations known." Roberts also pointed out that the name of the complainant is redacted in the publicly available affidavit. Pullen expressed his unwavering support for Mecum to Yellow Sheet, "I think the charges are baseless....He says he didn't use [the voter registration database] that way, and I have no reason to believe he used it that way....There are hundreds of people who have access to Voter Vault." Pullen said later in his statement, "He used Voter Vault. The Republican National Committee owns Voter Vault....It's a private list. We own the list. We can do what we want with the list, quite frankly. Mecum told Yellow Sheet, "This is completely bogus. At the end of the day, I will be exonerated in all of this. This happens a lot in politics, unfortunately. When you have a high-profile job like mine, you sometimes make some enemies." Unfortunately for Mecum, his political enemies seem to be within his own political party. In fact, it is a felony to use the voter registration database (aka Voter Vault) for anything other than official purposes. In Arizona, misuse of the voter registration database is a Class 6 felony, which means Mecum could face a couple of years in the clink if convicted. If the staffer knew why he was looking up the woman's information, the staffer could also face charges. Additionally, to access Voter Vault, which is a customized interface for the database, the user must sign an agreement with the Republican Party saying they will only use the database for party-related business. Arizona also has strict laws against both harassment and stalking. Arizona law considers behavior stalking if it "would cause a reasonable person to fear for the person's safety." Behavior is considered harassment in Arizona if it meets one of several criteria, including if a person "surveils...for no legitimate purpose" and if it "would cause a reasonable person to be seriously alarmed, annoyed, or harassed." Mecum has also been at the center of a skirmish this year within a local Republican club, Republican Professionals (aka, Politics on the Rocks). Two of Mecum's roommates were accused of harassment (allegations they denied) and subsequently the President of the group attempted to remove them from the Board of Directors, which resulted in an organizational split. This saga unfolded on local Republican blogs, which covered the intraparty feud.